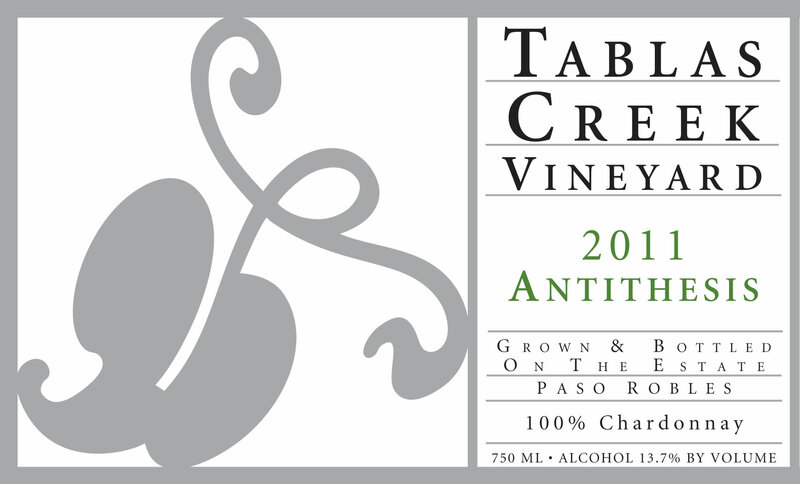 The 2011 Tablas Creek Vineyard Antithesis Chardonnay is Tablas Creek’s twelfth bottling of this traditional Burgundian varietal. In the early 1990s, we imported all our Rhône varietal cuttings from France. At the same time, at the request of a Sonoma winery, we imported the highly regarded small-berry, low-vigor Chardonnay clone named “La Vineuse” and planted 1.5 acres to produce a small amount of bud wood for sale. In 2000, we got our first small crop of Chardonnay. The 2011 Antithesis shows a rich, creamy nose, exceptionally characteristic of Chardonnay with a little sweet oak, pear and crushed rock. The mouth is rich, round and luscious with flavors of pastry cream and preserved lemon, yet firmly dry. The long, mouth-filling finish adds a briny mineral note at the end. Drink now and for the next five years. The 2011 vintage was our second consecutive winter with healthy rainfall, but yields were dramatically reduced by two nights of frost on April 8th and 9th, impacting particularly the early-sprouting grapes like Chardonnay. Despite the low crop loads, ripening was slow due to a very cool summer, and harvest roughly three weeks later than normal, beginning in mid-September and not concluding until mid-November. The long hangtime and low yields combined to produce fruit with notable richness balanced by higher than usual acidity, all at low alcohol levels. The Chardonnay was harvested on September 28th and October 4th. The Chardonnay grapes were whole cluster pressed, and fermented using native yeasts in a mix of neutral oak and stainless steel barrels to preserve the wine’s varietal and mineral character. The wine went through full malolactic fermentation in barrel. It was bottled in July 2012, unfined and unfiltered.